Four years ago, I began a project that I named the Dead Anglican Theologians Society. It was inspired by a moment during a walking tour of the Dublin churches at the end of the International Eucharistic Congress in 2012, when I was given a booklet produced by an organisation calling itself the Dead Theologians Society. They were all dead Roman Catholic theologians and some were unusual choices, including Josemaría Escrivá de Balaguer (1902-1975), the founder of Opus Dei, who is not among the dead theologians I would like to introduce to young people exploring faith and theology. Indeed, I was disturbed by the emphases in the descriptions of Spain during the Spanish Civil War in that one essay. Also disturbing was the obvious gaps created by giving no place to Pierre Teilhard de Chardin (1881-1955), Henri-Marie de Lubac (1896-1991), Yves Marie Joseph Congar (1904-1995), Karl Rahner (1904-1984) or Hans Urs von Balthasar (1905-1988) – perhaps the five greatest but dead Roman Catholic theologians of the last century. Nor was there any place for either Oscar Romero or Pope John XXIII. I started putting together similar profiles of key Anglican theologians of the past, and I have already collected 19 postings – an introduction, biographies of 17 theologians from the past, from Thomas Cranmer to Nicholas Ferrar, and notes six key Anglican composers. The project has stalled and has been a little neglected in recent years, although I hope to return to it at some stage in the future. I was reminded of it again last night, as I began to prepare a posting for tomorrow morning [25 September 2016] to mark the 390th anniversary of the death of Lancelot Andrewes. … I doubt that there is ever going to be a companion volume that includes Sergei Nikolaevich Bulgakov (1871-1944), Georges Florovsky (1893-1979), Iustin Popović (1894-1979), Archimandrite Sophrony Sakharov (1896-1993), Vladimir Nikolayevich Lossky (1903-1958), Dumitru Stăniloae (1903-1993), Alexander Schmemann (1921-1983), John Meyendorff (1926-1992), John Romanides (1927-2001), and who are, perhaps, the leading dead Orthodox theologians of the last century. That was four years ago, and I had not realised how wrong I was going to be. For the past few weeks, I have been using as my late night devotions a book I bought during a conference in Westcott House in Cambridge late last year [13 November 2015] and that covers precisely this field. Andrew Louth is the author of Modern Orthodox Thinkers, from the Philokalia to the present (London: SPCK), which was published last year. Father Andrew Louth is perhaps the most important English-speaking academic in the field of Patristics. He is Professor Emeritus of Patristic and Byzantine Studies in the Department of Theology and Religion at Durham University and is the author of many books, including Introducing Eastern Orthodox Theology (London: SPCK, 2013), and the editor of Early Christian Writings (London: Penguin, 1987). I have known him for many years, and he has been my lecturer in Cambridge on courses in Sidney Sussex College organised by the Institute for Orthodox Christian Studies. 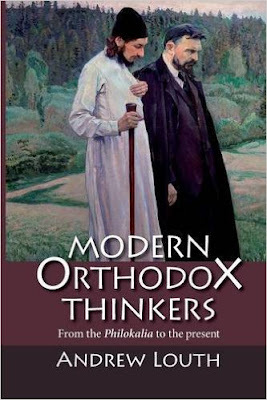 Modern Orthodox Thinkers is an illuminating and very readable introduction to the living theology of the Orthodox Church. Father Andrew covers each of the great Orthodox theologians I named and many more, men and women, who have emerged since the publication of the Philokalia in 1782. He offers his readers lively and perceptive accounts of the lives, writings and enduring intellectual legacies of the great Orthodox theologians of the past 250 years. In this book, he explores and explains the enduring influence of some of the greatest modern theologians. Starting with the influence of the Philokalia in 19th century Russia, Father Andrew moves through the Slavophiles, including Vladimir Solov’ev and Pavel Florensky in Russia, and then traces the story through the Christian intellectuals exiled from Stalin’s Russia: Sergeii Bulgakov, Nikolai Berdyaev, Georges Florovsky, Myrrha Lot-Borodine, Vladimir Lossky and Saint Maria of Paris (Mother Maria Skobtsova). He includes key theologians outside the Russian world: Romanian Dumitru Staniloae from Romania and Justin Popovic from Serbia, who both studied in Paris. He then considers the contributions of the second generation Russians: Paul Evdokimov, John Meyendorff and Alexander Schmemann. He then turns to the theologians of Greece from the 1960s, including: Ionannis Foundoulis, Vasileios Gondidakis, Metropolitan John Zizioulas, John Romanides, Dimitris Kouttroubis, Christos Yannaras, and Stelios Ramfos. Some of his choices are lay theologians, such as the late Philip Sherrard, who came from an Irish background, Elisabeth Behr-Sigel and Olivier Clément. Although Mother Thekla (Sharf) was Russian-born, she is discussed in the context of the English acculturation of Orthodoxy. There are influential monks and spiritual elders, especially Father Sophrony of the Monastery of Saint John in Tolleshunt Knights, Essex, and his mentor, Saint Silouan. After a chapter on Father Aleksandr Men’, Alexei Losev and Sergei Sergeyevich Avernitsev and theology in Russia under Communism, the book reaches its conclusion with an introduction to Metropolitan Kallistos of Diokleia (Timothy Ware), whose influence in the English-speaking Orthodox world has been unparalleled, and who is closely associated with the theological vision of the Philokalia, both by spearheading the translation of the Philokalia from Greek into English and by presenting its vision of theology in his own theological reflections. Father Andrew admits there are many others he could have included, including the 19th century Metropolitan Philaret of Moscow, for example, along with Metropolitan Anthony Bloom and Father Lev Gillett. He might also have included in his list of omissions Saint John of Kronstadt, Seraphim Rose, Elder Paisios, and Mother Gavrilia, to name some names. But this goes to show that there is room for a second volume, and that Orthodox theology is not about dead theologians. Indeed, Father Andrew shows how contemporary Orthodox theology is like a spring flower that has budded after a harsh winter’s thaw. As for the Dead Anglican Theologians Society, the blog is still available here. I must return to it soon.